Beautiful cover Ali, wishing you a wonderful journey that you seem to be riding so well. I enjoy your posts. It’s been a difficult week; two children sick at home, and now I have contracted the dreaded lurgy myself. It’s not conducive to sleep, writing or creativity. However, I got all my re-writes done, and have just started the final edit before sending my new little book-baby out into the kind (I hope!) hands of my lovely beta-readers. Current word count is 30, 317, but I expect to reduce that as I edit. This is the last time I will post about Swanskin until nearer its launch date. Btw, if anyone’s interested, I’m looking for two more beta-readers. Bright and light from Jane! Thanks. Here’s one I haven’t tried on you yet, just tested it myself the day before yesterday. It’s a neat form of six line stanzas using the syllable pattern 3/5/3/3/7/5. There’s no rhyme required but you can add as many stanzas as you like. Too hard for the weak. 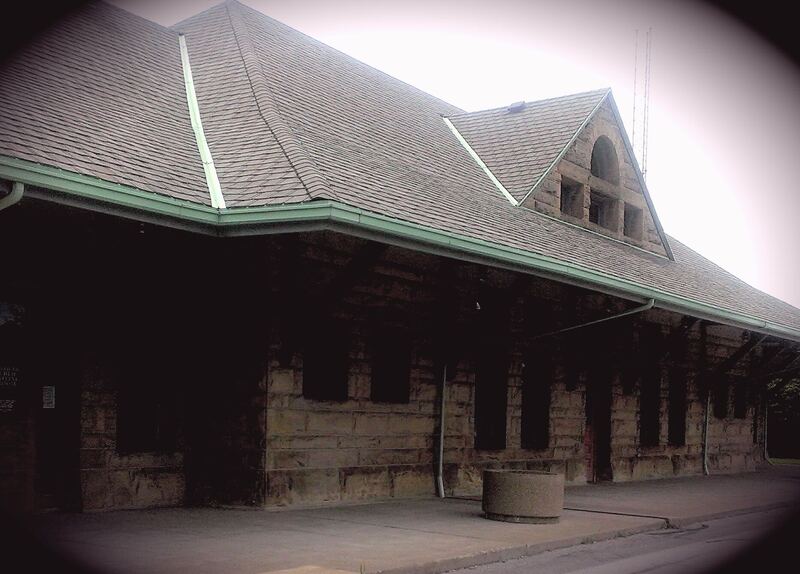 I am pleased to announce that I received an Honorable Mention for my poetry collection titled, “Autumn Quotes.” Here’s a picture of North Depot in Sandusky, Ohio where one of the poems takes place or there by a closeness in proximity. I entered it in a book festival in Orlando, Florida last year and the ceremony will be held in Boston, Massachusetts in January. The table is open for winners, runner up entries and honorable mentions. I’d love to go but have stylist class and no money. The winner gets the trip paid. Lucky dog. The Omni Parker Hotel and specifically the Saturday Club will hold the special occasion. This felt good to be noticed among other entries. I selected this festival based upon recent research about the state and my thoughts on its history. Autumn Quotes is my first poetry collection that surprised me in that I didn’t know I had such intricate and beautiful words inside me. I had written a couple poems in my youth, performed in the arts but never tried so many forms or been encouraged to write. Read, yes. Write, no. I plan on beginning a second volume later this year and already have the title. This time it will be saucier, more in depth, using less restraint and you can see this by the title, “Smoked and Spiced.” I will explore more forms and use as many as possible. Most definitely it will contain the ways of the world. I look forward to this venture. For now here is a poem from my book available on Amazon “Autumn Quotes” by Caroline Clemens … the winter section! My train passed by your factory yard. Every trip I longingly look your way. Chatting with the ladies til the whistle blew. I caught the swirl of your skirt, the bounce in your step. You turned your head and with the wink of your eye, I smiled. Lips that spoke to me of promises I knew not. Tomorrows wait pained me, so many breathes away. But I would come again to see my Pearl. Heat of the summer consumes us inside as we toile. We head outside for relief and pat our foreheads dry. The train comes by bringing us a slow noisy breeze. The girls and I talk nonsense sipping tepid drinks. Never long enough this break, the whistle blows too soon. Inching by the train is almost gone; a man with a hat catches my eye. I stand and turn gazing upon these eyes with a lustrous smile. My left eyelid descends, I know not why; lips parted waiting for my breath. Anxiously, I must wait for tomorrow to see my John. Two in the morning and I depart North Depot Street. Hoping you are still up and waiting for me. I’ve been to Cleveland and back, the night watchman in the caboose. The New York Central and I, all alone out there, year after year. Some years went by fast and others very slow. Til I met you … then the sun came out like a broad way show. Its ice cream sundaes, radio ball games, trains, zoos, and late night rendezvous. Dinner is over, watching Johnnie on TV, I’m waiting for you. Blessed was the day I saw you looking at me, your lips curved up. The smile surprised me and united my senses, I relented. Now regularly you come to my front door. Buying me gifts from your travels to cities, east and west. After midnight I hear the whistle, the in-bound train at the depot. Let’s play some cards and laugh out loud. All these miles I’ve walked round this town. Visited the doctor, dentist, barber and the liquor store, too. Traveling by two feet, never driving a car, exercise! Walk, walk, walk, read my prevention magazine. Ate my homemade salmon loaf, iceberg lettuce and fried everything else. Followed by ice cream and a True Story read. I miss you when you take your walks, like to go, too. These legs of mine gave out long ago from cane to walker, chair then bed. Sometimes, I just cry and let it out! Yes, I feel sorry for myself. My granddaughter says I give to everyone but me. She says I make her feel better, that’s why she comes so often. What would I do? Where would I be without you? Now you’ve gone first and I am alone, missing you. Are you waiting for me? I’ll wait forever, take your time. I’m not going anywhere, I love you. This lifetime together tells me our love is forever! Click on Amazon for purchase site and to see other books by this author.